“Spiritual enlightenment is like living a life from being blind and then seeing everything. You can attain sudden enlightenment by practicing Ganhwa Seon,” said Ven. Jongho, who is the director of the Institute for the Study of Korean Buddhism. These were his opening remarks at the 2nd international conference on Ganhwa Seon. As Korean society becomes competitive and complex, Zen (Seon) meditation draws growing popularity in that it gives people true happiness and some say enlightenment. Many people agree on the usefulness of practicing meditation. Kevin Kelly, the founding executive editor of Wired magazine, emphasizes that an empty mind is the key word of future management. He says that, you need to be trained to have your own time to empty your mind and to concentrate on newly arising phenomena if you want to be a leader in any field. Many people are curious about how to meditate and attain enlightenment. One such method claims to be the meditative practice, Ganhwa Seon. It is thought to be one of the most developed meditation methods in Buddhism and has been the primary method carried out by the Jogye Order, the largest Buddhist sect in Korea. The 2nd International conference on Ganhwa Seon with the theme “Ganhwa Seon, its Principle and Structure,” was held last August at Dongguk University’s middle auditorium. 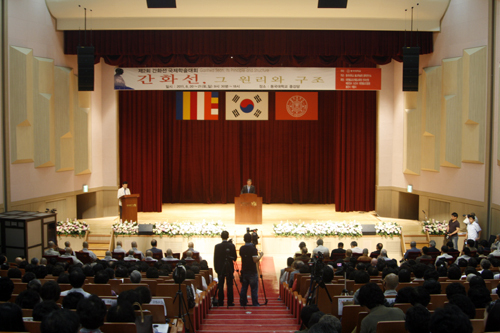 Unlike other international academic conferences, the Ganhwa Seon conference offered opportunities for both study and practice, and the general public were encouraged to participate. Many participants said they were satisfied with the actual practice and asked probing questions to the scholars who attended. This time made Ganhwa Seon, which was considered difficult, accessible and popular. In Korea, Ganhwa Seon has academic significance because the tradition has been correctly preserved. The practice originated in China and eventually Ganhwa Seon spread to Korea in the 13th century and became the primary method of the Korea Buddhist sect. With meditation centers in urban areas becoming more popular, now people from all walks of life can take part in and have more opportunities to find their true selves. Ven. Jongho said, “When we consider typical meditation methods in Eastern-Asia, Ganhwa Seon is one of most representative practiced methods. Although the original form of Ganhwa seon is well-preserved, it is not unfamiliar in the world.” he added that I expect this international conference will contribute farther to globalize Ganhwa Seon. Dissertations about Ganhwa Seon which were announced on the conference will be published in Korean versions by end of the year, and will be distributed in English early next year.